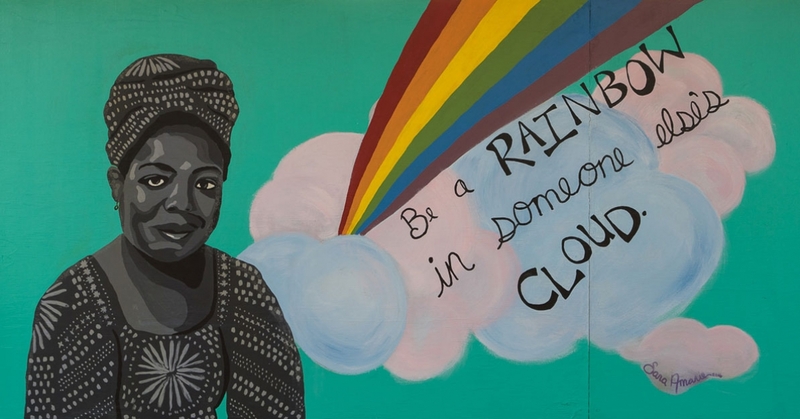 COMPASSION: Maya’s works of fiction and poetry lift up the stories of African Americans, women and LGBTQIA+ people, humanizing them and viewing them with compassion. COLLABORATION: In 1959, the acclaimed Civil Rights leader Dr. Martin Luther King Jr. asked Maya to be help coordinate the Southern Christian Leadership Conference, a group of organizers that carried out the famous nonviolent protests which led to the American Civil Rights Movement. RESPECT: During Maya’s travels, she made many new friends. Some of them are now quite famous, such as Malcolm X and James Baldwin. However, at the time Maya did not know they would become the widely-known leaders we think of today. By treating all people with respect, Maya established important relationships that helped her achieve literary success and share her message of human rights. CELEBRATION: Maya’s memoir, I Know Why The Caged Bird Sings, is as much of a celebration of her early life as it is an acknowledgement of the pain and trauma she endured. By celebrating her truth, Maya’s book became the first non-fiction bestseller written by an African-American woman. Maya Angelou was born in St Louis, Missouri in 1928. At this time, there were very few economic opportunities for African American people, and her family did the best they could to survive. Her best friend was her brother, Bailey. Sometimes, she and Bailey lived with their mother, and sometimes they stayed with their grandmother. But, not everybody could be trusted. Her mother had a boyfriend, who abused Maya. When she told her family, her uncles killed the boyfriend. Maya was so shocked by the power of speaking up and saddened that her voice resulted in somebody’s death. After that incident, she chose to not speak. She stopped talking for five years. Eventually, Maya could not be quiet any longer. She began expressing herself through art—mostly writing poetry and stories. She was very creative, and soon was acting in theater too. Exposure to the arts began providing her with opportunities to travel, meet new people, and perform. At age sixteen, Maya had a son. Despite her love of acting, theater and arts, she had to take a break and come up with a plan to support him. She was living in San Francisco, California at the time, but she decided to move south to San Diego. She worked a variety of odd jobs for many years. Her creativity was put to use learning how to survive. In 1954, she was discovered by a theater group and offered a part in a touring play. That year, she performed in twenty-two countries around the world. When she got back to the United States, she moved to Harlem, a predominantly African American neighborhood in Manhattan, with a rich African American literary tradition. 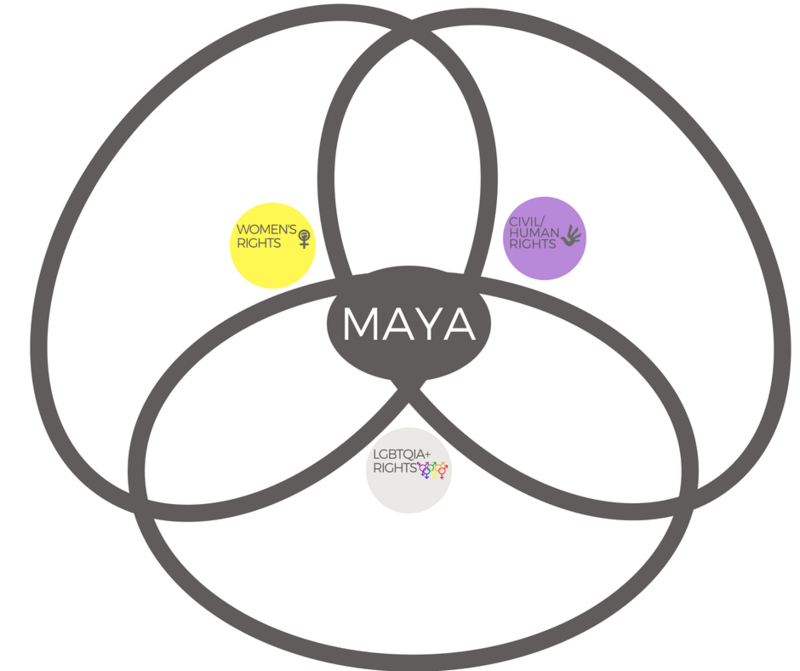 Maya met influential writers and artists, and she got involved in the Civil Rights Movement, which was beginning to gain momentum at that time. However, she soon decided she needed to spend time in the Africa. In 1961, while dating a South African freedom fighter, she moved to Egypt and worked as an editor. She then lived in Ghana where she worked in a university as well as an editor and freelance writer for two publications. She was involved in the African-American expatriate community, or the community of people who emigrated from, or left, the United States. She became friends with civil rights revolutionary and leader of the Black Panther Party, Malcolm X, during his visit to Accra, Ghana. During the early 1960s, Maya’s writing flourished, in part because of the African cultural renaissance -also known in Harlem, NY as the Harlem Renaissance- that was occurring on the continent. African poetry, music, and art was blossoming, thus becoming more known across the globe. When Maya returned to the United States in 1965, she wanted to produce and publish art. She did so feverishly, moving between Los Angeles, New York, and other cities. This was the time of the Civil Rights Movement, so people like Maya were often very mobile. They traveled where they needed to be to organize protests and nonviolent actions. But Maya’s art never ceased. Though she is famous for her books and poems, Maya’s work was prolific. In the 1970’s she became the first African American woman director in Hollywood. She wrote and produced several documentaries, including a PBS special called “Afro-Americans in the Arts.” For this work, she received the Golden Eagle Award. In 1981, Maya became a professor at Wake-Forest University in North Carolina. She continued publishing books, including several memoirs and books of poems. Her work included themes of struggle, pain, and trauma, but also resilience, love, and beauty. Maya continue to receive acclaim and recognition for her work, which is honest, brave, and beautiful. In 1993, President Bill Clinton requested for her to write and read a poem for his inauguration, thus making her the first inaugural poet since 1961. She received the National Medal of Arts in 2000, and in 2010 President Barack Obama awarded her the Presidential Medal of Freedom. In 2014, at age eighty-six, Maya Angelou passed away in her home in Winston-Salem, North Carolina. Her legacy is one of bravery, truth, and art. Speaking and Listening Standard 1: Initiate and participate effectively in a range of collaborative discussions (one-on-one, in groups, and teacher-led) with diverse partners on grades 9–10 topics, texts, and issues, building on others’ ideas and expressing their own clearly and persuasively. Speaking and Listening Standard 2: Integrate multiple sources of information presented in diverse media or formats (e.g., visually, quantitatively, orally) evaluating the credibility and accuracy of each source. Speaking and Listening Standard 3: Evaluate a speaker’s point of view, reasoning, and use of evidence and rhetoric, identifying any fallacious reasoning or exaggerated or distorted evidence. U.S. II Standard 4.3: Students will identify the civil rights objectives held by various groups, assess the strategies used, and evaluate the success of the various civil rights movements in reaching their objectives, paying specific attention to American Indian, women, and other racial and ethnic minorities. U.S. II Standard 4.2: Students will use case studies involving African-American civil rights leaders and events to compare, contrast, and evaluate the effectiveness of various methods used to achieve reform, such as civil disobedience, legal strategies, and political organizing. Objective: Students will examine historical photos of the Civil Rights movement. Then, they will organize the photos into chronological order, while they compare artistic elements of the photos with those utilized in the poems. They will then assign a poem to each image to convey a narrative with an appropriate tone, feeling, and timeline. What is the best advice that you’ve ever given? What is the best advice you’ve ever received? From whom did you receive it? Create a handout of Maya Angelou’s poems. Be sure to include the date, if possible. Create a packet of photos from the Civil Rights Movement, with captions and dates. Print your packet single-sided so that students can cut the photos out. Pass out poem handout along with collection of Civil Rights photos. Go through photos with students and answer their questions. Scaffold their exploration with important dates, events, movements, leaders, etc. Ask for volunteers to read each poem out loud, while the rest of the students observe the photos and listen. Tell students they will be creating a Civil Rights scrapbook (choose whether either individually or in groups). Have them arrange the photos in chronological order, and select one of Maya Angelou’s poem to accompany each photo. For each photo, they must select the poem they feel is most appropriate for the plot, tone, and mood of the photo. Have students search the library for newspaper clippings to add to their scrapbook. Extend the timeline of the scrapbooks to include the Black Lives Matter movement of the 21st century. Or, have them make a separate scrapbook for this movement. Ask students to consider whether the Civil Rights movement is actually “over,” or still evolving. Include contemporary poets works for the period of time after Maya Angelou’s death. Ask students to read Sarah Kendzior’s “The View From Flyover Country.” Discuss: Why does Kendzior refer to St. Louis as “Flyover Country?” Do you agree? Maya Angelou was from St. Louis, or Flyover Country. How do you think it has changed from the time Maya Angelou lived there? How do you think it is the same? Have students reflect on Martin Luther King’s quote “A riot is the language of the unheard.” Ask them why those who protested during the Civil Rights Movements felt unheard. Who were they unheard by?